Classical ballet from a 2nd generation Cecchetti dancer and dance specialist for ages 6 and older in pre-ballet, beginning, intermediate and advanced levels with hundreds of combinations, including a separate section of pointe work. The advanced level is also a resource for dancers to draw from for daily class, warm-up before performance and choreography. This text is in the "Rhythmic Movement Dance Series" and evaluated in the Gateway to Educational Materials (GEM) of the United States Department of Education. 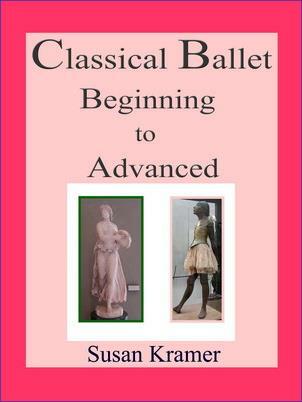 "Classical Ballet Beginning to Advanced"
About the author: Susan Kramer is a graduate of Peabody Institute Dance of Johns Hopkins University, and has been teaching yoga, ballet, rhythmic dance and academics kinesthetically as a dance specialist since 1965, and maintains a large educational web site at susankramer.com. She is the author of the "Rhythmic Movement Dance Series," part of the Gateway to Educational Materials, project GEM, of the United States Department of Education. Content Copyright Susan Kramer 2002-2017. All Rights Reserved.